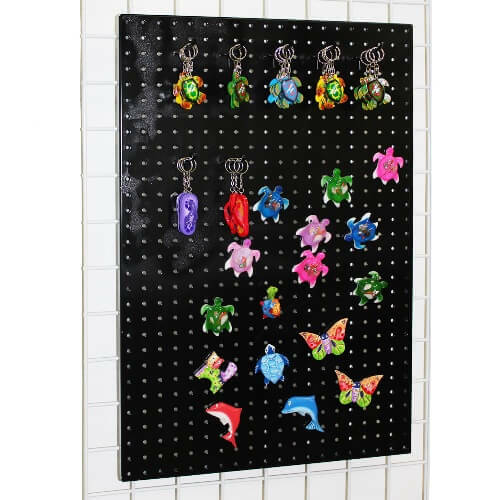 This Metal Grid Panel For Magnets And Peg Hooks is a tremendous asset to your store. Attach to your gridwalls and grid displays to hang products with peg hooks, as well as magnetic pieces to your metal panel to show off each and every piece. Made of black powder coated steel, this display blend with any decor. Set up impulse displays near your registers or in high-traffic aisles. Place lots of fun souvenir items such as keychains and destination themed magnets. Lots of people tend to collect smaller items such as magnets featuring the location they visit or keychains with fun characters and decorative pieces attached. Order your black metal panel today!